Get ready for open world Mediterranean mayhem! And then get unready again, because there's still a bit of a wait before Just Cause 3 is released. On stage at Square-Enix's E3 press conference, Avalanche announced the chaotic explode-'em-up's release date as December 1. A new trailer explains all the improvements planned for the sequel. It's looking great—like Just Cause 2 with every element turned up. There are multiple grapple lines this time. Technically, there were multiple grapple lines in Just Cause 2, but only because of that mod that we all installed. Also: upgraded parachute, the ability to control grapple tension, and, of course, that wingsuit. In addition, there's a whole bunch of cars and guns, and advanced physics-based destruction for buildings and vehicles. And yes, plenty of silly challenges complete with leaderboard support. 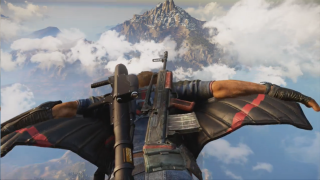 For more, check out Andy's rundown of why you should be excited for Just Cause 3.